The US government demanded that Osama Bin Ladin and those who helped plan the 9/11 attacks be turned over to the US government. When the Taliban government of Afghanistan where he was hiding refused the US together with NATO invaded the country and forced the Taliban out of power at least in the major cities. The war has gone on to this day. Osama Bin Laden had based his operations in Afghanistan since 1996. After the attacks on the Twin Towers and Washington DC by Al Queda, the UN Security Council issued a resolution demanding the Bin Lend be turned over to the United States. President Bush in his address to Congress on September 20th demanded that the Taliban who governed Afghanistan turn over the Al-Queada members who were in Afghanistan including Bin-Laden. When they refused the US together with members of NATO began a campaign to remove the Taliban from Afghanistan and capture members of Al-Qaeda. 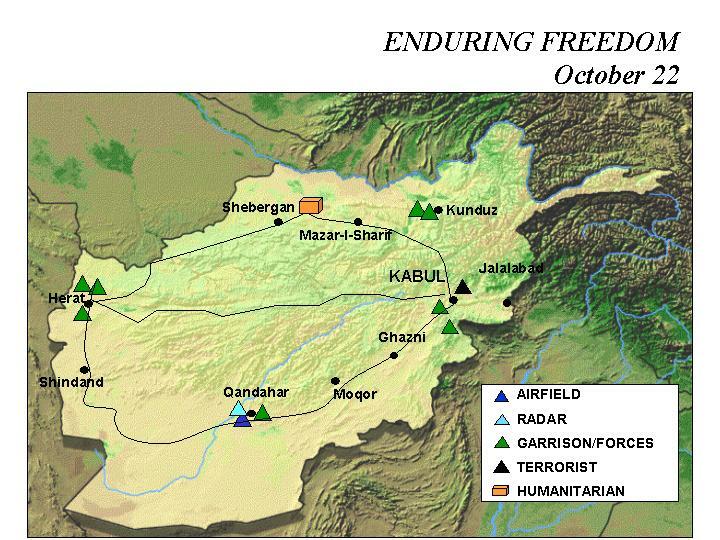 On October 7th NATO forces launched air assaults on Taliban and Al Qaeda targets. US forces linked with members of the Northern Alliance who had been fighting the Taliban's for years. Initially, the Northern Alliance made a little progress against the Taliban despite repeated US and allied attacks on their positions. While little progress was made in most of October by the end of the month, Taliban front lines began to crumble against repeated and accurate air assaults. On November 9th Northern Alliance forces together with the support of US Special Forces captured the city of Mazar-e-Sharif. The fall of Mazar-e-Sharif resulted in the near total collapse of Taliban forces. On November 12th Taliban forces evacuated Kabul, which was occupied the next day by the forces of the Northern Alliance. The TalibanÍs quickly lost the other cities of Afghanistan. On December 7th the last remaining Taliban stronghold Kandahar fell. Before it did the Taliban leader Mullah Omar escaped the city. Meanwhile, the forces of Al Queda had retreated to the Toro Boro area, in the mountains along the Pakistani border. The US relied on local tribesman to attack the Al Quida positions there. By December 17th the last caves of Toro Boro had been overrun. Osama Bin Laden and the rest of the Al Queda leadership, however, were not to be found. They had escaped to Pakistan. Thus by the end of the year, the US had succeeded in supporting local Afghanistan forces with a UN mandate to overthrow the Taliban rule in the country. However, both the top leadership of Al Queda and the leadership of the Taliban escaped. In 2011 US special forces located Osama Bin Laden in Pakistan and killed him. As of 2019, the war continues against the Taliban.